The Tour Reports section of the site now contains the posts that I sent to the Phred Touring List (now on Google Groups) during the Tour. Those from the early days of the Tour were rather thin, while later on, for some of the more unique countries, they contain much more thorough accounts of the ride, and an occasional amusing anecdote. Towards the end of the Tour, however, I frequently couldn't keep up with the chore of sending posts on time, so the last several were written after the Tour was complete. Look for links to the posts at the end of the short descriptions beginning below. On this, and all other route maps, the blue lines represent travel by ship, red by airplane (Booo! ), and green by bicycle. The actual route for Stage 3 was considerably modified at the beginning and at the end from my original plans, while the middle section went according to the original route. 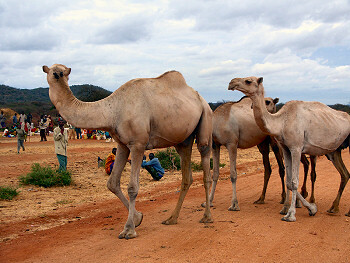 A long tour through Ethiopia was added, and consequently the route through northern Kenya had to be changed. Big changes were made (twice) to the in route South Africa thanks to my sea transfer plans, which, annoyingly, were cancelled. Twice. 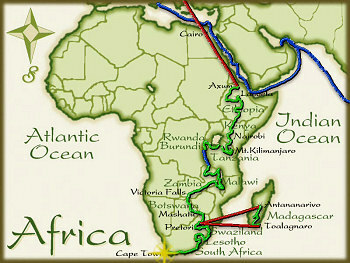 Swaziland was removed from the route, then returned later on, and Madagascar was shortened, which was a huge disappointment. On the other hand, I did manage to ride all the way to Cape Town, which was one of my original goals, and one that I did not think I would have time to achieve. With the various possible changes to my sea transfer from Asia to Africa, I needed to come up with a new staring point for Stage 3. There were not many to choose from, as you might expect, though I considered still starting at Mombassa, my original choice. Another possibility was Djibouti, and I was fairly intrigued by that city. 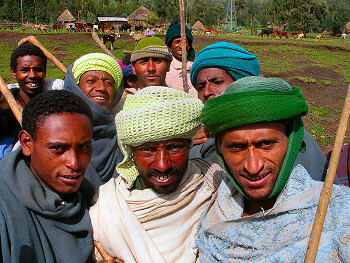 However, as I looked at a map of the region, I became more and more interested in starting in Ethiopia. I had not considered that country in my original plan, but I soon learned that there are many incredible sights to see in that land. Once I finally settled on a transfer plan from India, which would, unfortunately, require me to arrive in Cairo via air, I decided to officially added Ethiopia to the route. However, that meant another unfortunate bit of flying since I was not very enthusiastic, nor had enough time, to ride through Sudan to Ethiopia. 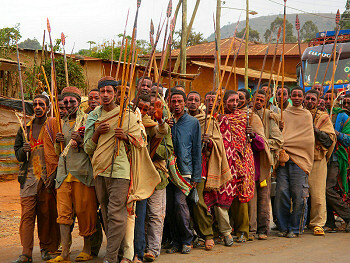 So, my new starting point for the Stage, would be Axum, Ethiopia, a small town in the very north of the country, close to the closed border with Eritrea, and a town right in the heart of the countries historic zone. As has now become a tradition for the Tour, that meant that the start of the Stage would be rough and wet. July is near the beginning of the rainy season, and the northern areas of the country are well-known for rugged terrain and bad roads. Why break with tradition? 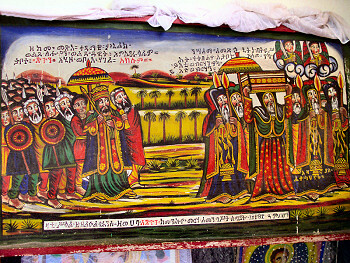 The route then began in Axum, the capital of the ancient Axumite Kingdom, then ran to the west and south, through the rugged Simyen mountains. 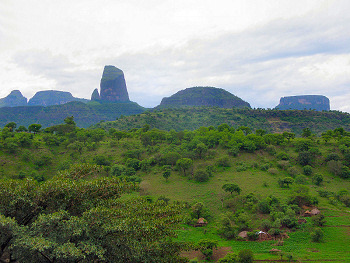 The entire area consisted of very slow and difficult traveling, but with the frequent rains, the landscape was fresh with brilliant green colors. Continuing on, I visited Gondar, which contains some interesting historic site, and Bahir Dar, a relatively large town on the shore of Tana Hayk, the lake that is the source of the Blue Nile, and which contains several interesting monasteries on its small islands. 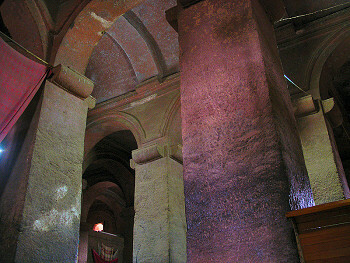 Some more difficult riding led to the one of the more impressive sights of the Stage, the 11 Rock-Hewn Churches in Lalibela. Going there was not easy, but it was well worth the extra effort. Beyond there, the roads were usually much better though there was still some rough terrain and bad weather. In spite of that, I reached the capital, Addis Ababa, after a while for a short rest break. The route then continued to the south, through a part of the country that contained a variety of landscapes, but was generally a little drier than the area I had just left in the north. That region was also where I had my first encounter with Africa’s Great Rift Valley. There, a huge piece of Gondwanaland is splitting off from the main body of Arfica, and slowly heading out into the Indian Ocean. I would meet the rift many more times before the Stage was complete In that area, traveling conditions were a lot easier, but I was already 5 or 6 days behind where I wanted to be by that time. Nevertheless, I reached the Kenyan border at Moyeni, without much additional trouble. Arriving at Moyeni at the Ethiopian border was a significant change from my original plans to start at the pleasant Kenyan seacoast. In fact, the entire route through Kenya was considerably adjusted and was not really as long or as interesting as I would have liked. The entire route in the northern part of the country was extremely, and surprisingly, tough as the highway deteriorated to a rocky nightmare while crossing the lonely Dida Galgalu desert. After a while, I reached the central part of the country, surrounding Mount Kenya, which was much more developed than the areas I had previously crossed. The weather there was always cloudy, however, and I never really saw the great mountain. 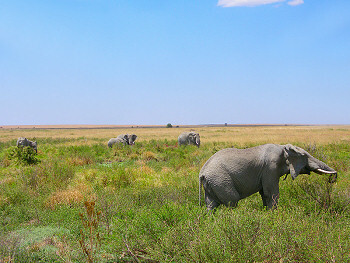 However, in this region, I did have my first encounters with African megafauna, one of the few parts of the continent were I did so outside of a game park. The route continued south, through Nairobi. Normally I would never visit such a large city on tour, but sometimes there is no easy way to bypass the major cities. In this case, I was happy to get to a place where I could have a few decent meals. 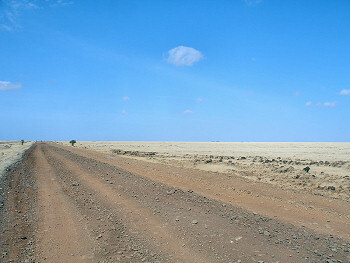 The end of the route through Kenya was a quick ride to the Tanzanian border post at Namanga. 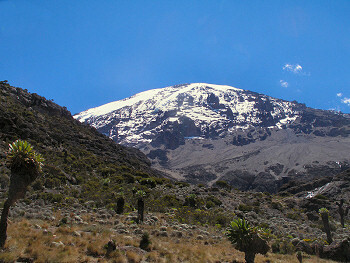 Mount Kilimanjaro was, obviously, a section of the Tour where I spent a week off the bike. 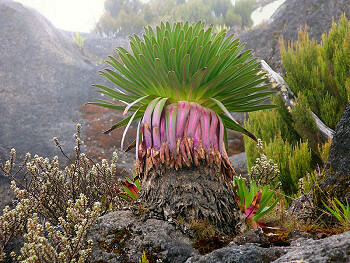 I was very interested to see the fast-shrinking glaciers on the summit of the 6,000 meter peak, as well as the unique, endemic, plant life which grows in the Afro-Alpine zones. 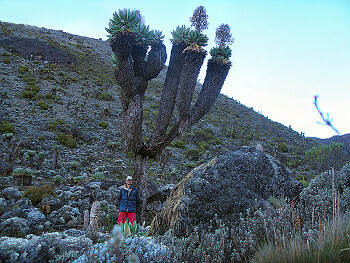 Of course, there is no way to do that other than to take a 5-6 day trek up to the peak with a licensed tour company. That was rather costly, and I did feel considerably guilty to have the large crew of porters carry most of my belongings, as well as those of the many other climbers. Nevertheless, I was completely fascinated by the environment of the mountain, and proud of myself for reaching the summit, though at an eerily dark hour of 4:50 AM. It was a rather difficult climb, especially since I was much more used to cycling than walking, and because the day before I started, I sprained my left wrist during an encounter with some over-enthusiastic young boys, one of Africa's most dangerous creatures. I reach the summit of Kilimanjaro at 4:50 A.M.
Tanzania was probably the place where I spent the most time off of the bike during the entire Tour. That was not necessarily a bad thing, as it gave my sore wrist a chance to heal somewhat, and since the breaks involved seeing some impressive sights. 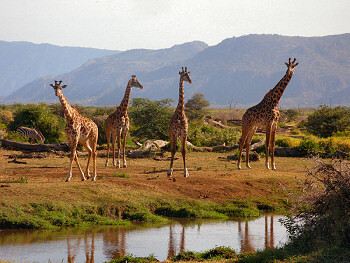 The route started in the vicinity of Kilimanjaro, at the Kenyan border, where it involved riding to Moshi the starting point for the climb, and then to, and beyond Arusha, the base for visiting the famous game parks of northern Tanzania. Those, for rather obvious reasons, don’t allow individual travel, or cycling, in the parks. 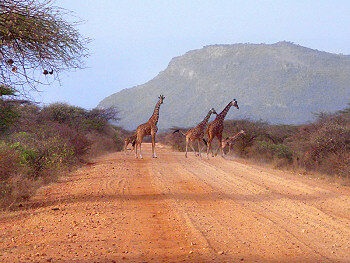 To see the parks, and their famous wildlife, one must book a standard safari. 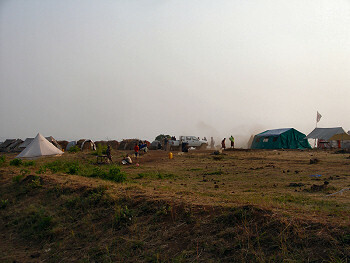 Mine was rather costly, since I was traveling solo, but made a little more affordable since I chose to bypass the luxurious lodges and camp in the designated campsites. 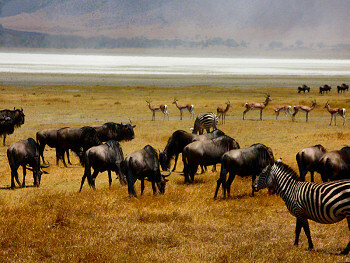 I visited three parks, Lake Manyara, Ngorongoro Crater, and Serengeti, in the company of a guide, driver, and cook. 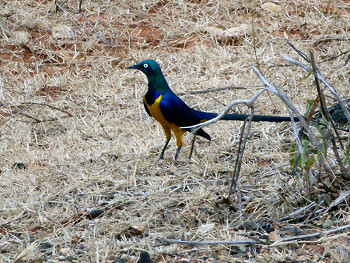 The animal viewing was actually a bit better than I thought it might have been, and I made good sightings of almost all of the major species. Nevertheless, by the time we reached the western exits of the parks, I was more than ready to begin cycling again. 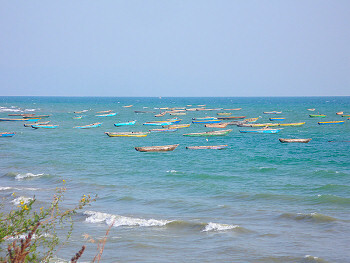 After leaving the parks, I rode to the shore of Lake Victoria, and spent a relaxing day at the relaxed town of Mwanza. My next goal was the border of Rwanada, and there were some unpleasantly rough gravel roads between Mwanza and there, made all the more uncomfortable by my bad wrist. Eventually, I reached the border and left the country for a couple of weeks. 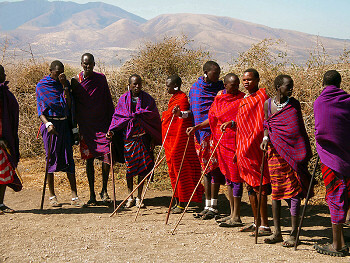 My last visit to Tanzania included more time off the bike. 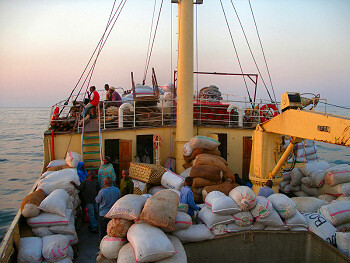 Arriving by bike at Kigoma, a port town on Lake Tanganyika, I arranged passage on the MV Liemba. That ship is an old lake ferry built in the early 20th century, which now takes passengers and some cargo up and down the length of the long, narrow lake. 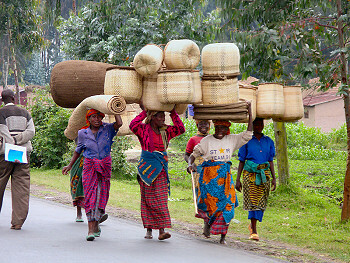 To me it seemed a nice way to skip the bad roads of western Tanzania, and have a brief rest in the process. 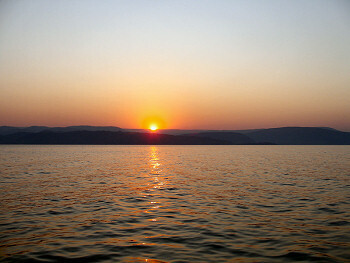 The 2-3 day voyage was interesting, if not exactly quiet, and there was some beautiful scenery along the way. 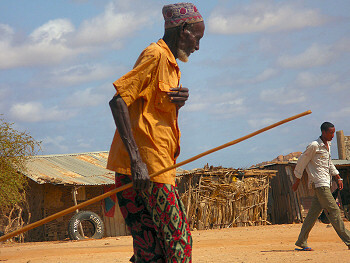 In all the Liemba was an effective and way for my to cross some rather difficult territory. I left the ship at its southernmost port, Mplungu, Zambia. 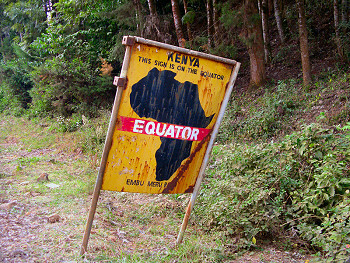 Rwanda and Burundi were also late additions to my route. I decided after visiting Cambodia, another country which suffered greatly in recent decades, that I also wanted to see these two small lands to see how they have recovered from the horrible events of the 01990's. 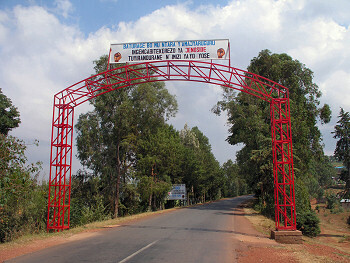 Rwanda came first, and I entered the country at the small border post at Rusumo Falls. I was quite surprised by many aspects of Rwanada, especially that the country is one of the most heavily populated in Africa. That was readily apparent after seeing the farms and gardens, which line the sides of hills and mountains running straight up to their summits. I was also a little surprised that the country had some of the best food that I found in Africa. Additionally, the rather modern infrastructure, especially the good roads, was a pleasant change of pace. This was all more apparent as I reached the rather modern capital of Kigali. 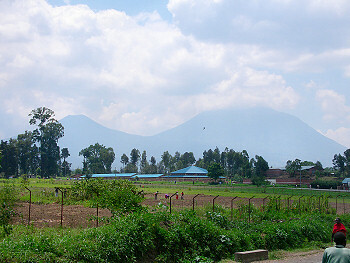 After staying there for a day, I rode up to the northern area, the landscape of which is dominated by several large volcanoes, The conditions in that part of the country were rather good, though the towns had a more African feel than Kigali did. 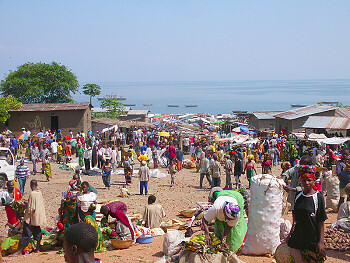 A little bit of confusion at the end of the route cause me to change my plans slightly, and take another voyage over water, specifically an overnight transfer down Lac Kivu on a beer-transport boat, to the town of Cyangugu, near the Burundi border. 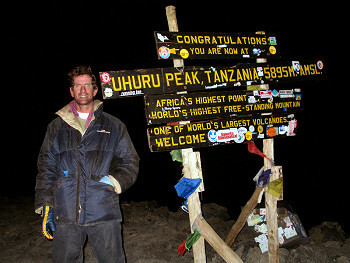 Axum to Tekeze Wenz R.
Comment: Kili Summit at Uhuru Peak before dawn, success! !